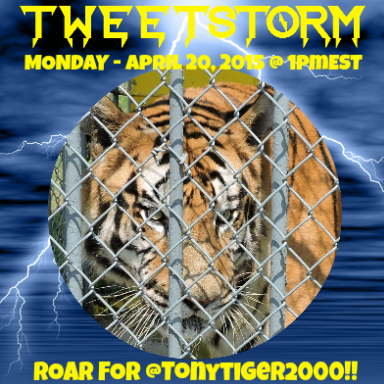 In Honor & Memory of Tony, we’ve joined the Animal Legal Defense Fund’s social media ambassador program ROAR! 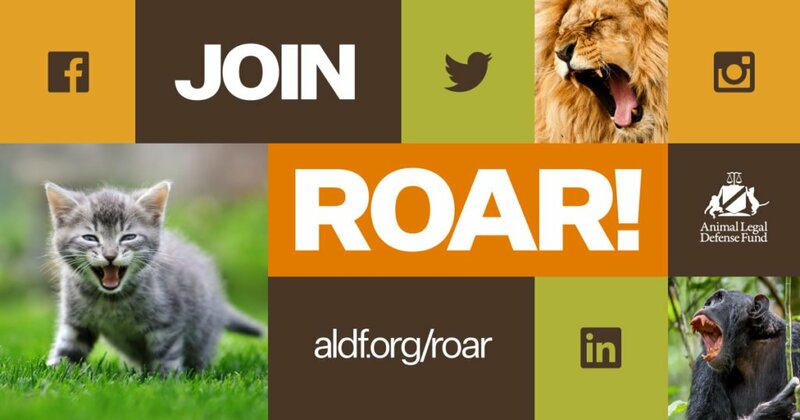 Remote Online Advocacy Representatives (ROAR) are online partners who help ALDF network important animal issues. It’s a great way to support ALDF and the important work they do for animals. Tony, the tiger who was forced to spend his life in a chain-link cage at a Louisiana gas station, has been euthanized because of his failing health. The Tiger Truck Stop’s “publicist,” Ted Baldwin, told news outlets that Tony’s health was declining and that he was in kidney failure. He was 17 years old and had spent nearly his entire life imprisoned at the truck stop. PETA, our friends at the Animal Legal Defense Fund (ALDF), and countless other animal advocates had been working to get him moved to a sanctuary for years. 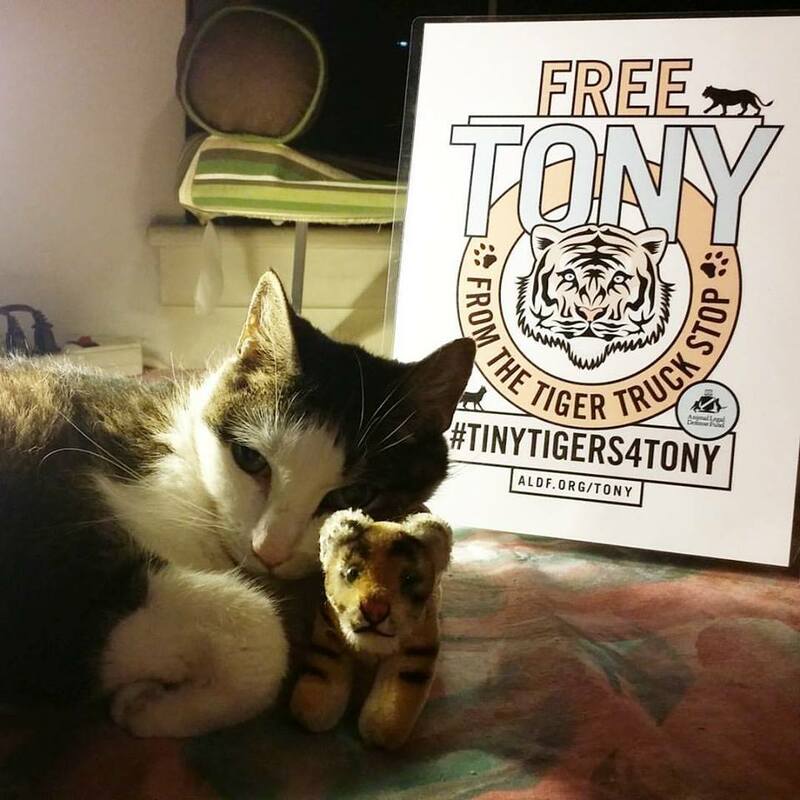 PETA lodged stacks of complaints with the U.S. Department of Agriculture, repeatedly offered to cover all costs of sending Tony to a reputable sanctuary, and stood behind the ALDF’s lawsuits in the tiger’s behalf. Even though Louisiana lawmakers passed a law restricting the ownership of exotic big cats, they included an amendment allowing Tony to be exempted. 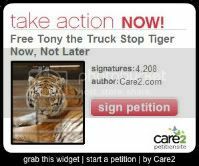 The gas station’s owner, Michael Sandlin, said that he plans to have Tony “stuffed, mounted and displayed.” He said that he also plans to purchase another tiger, though he wouldn’t legally be allowed to do so. He insists that he’ll file an “emergency writ” demanding another tiger, apparently believing that the gas station’s name necessitates the unlawful and abusive confinement of animals. Sandlin is seemingly unfamiliar with Caterpillar equipment, the country Turkey, Greyhound buses, Fox Sports, Grey Goose Vodka, the Polar Bear Plunge, and most professional sports teams, none of which use live animals for promotional purposes. The state would have to pass a new law in order for Sandlin to get another tiger, which is unlikely to happen. 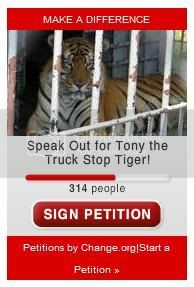 And PETA will fight vigorously to ensure that he’ll never get his hands on another tiger to imprison and torment in order to sell gasoline. 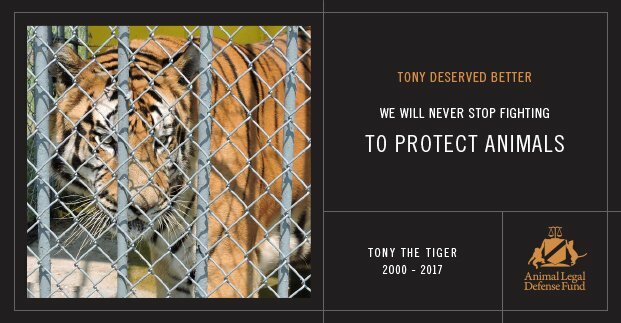 Tony’s abuse shows the extent of some humans’ sense of entitlement to other animals—who are as capable of suffering as we are—as well as the inadequacy of our institutions to protect them. 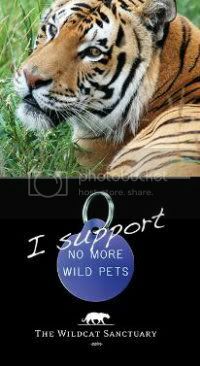 You can help protect tigers and other big cats from exploitation by people such as Sandlin by urging your representatives to support the Big Cat Public Safety Act, which would end private ownership of exotic cats, safeguarding communities from potential escapes and attacks and protecting wild animals from neglect and cruelty.